When you’re first learning how to play sports, it’s natural for you to focus your attention on the action around the ball (or puck in hockey). Your first instinct is to either move toward the ball to make a play or prepare yourself to receive a pass. It’s all about the ball—where it is, how to get it, and what to do when it’s in your hands. Even as you gain experience, you may still tend to focus much of your attention on what’s happening around the ball. You need to understand, however, that you don’t need the ball in your hands to help yourself and your team. Opportunities to make plays and gain advantage without the ball are available elsewhere on the field of play. Ones in which you initiate actions to create an opportunity. Ones in which you react to an opponent’s mistake. But as the diagram below illustrates, you can also move away from the ball to set a screen for a teammate on the other side of the court. 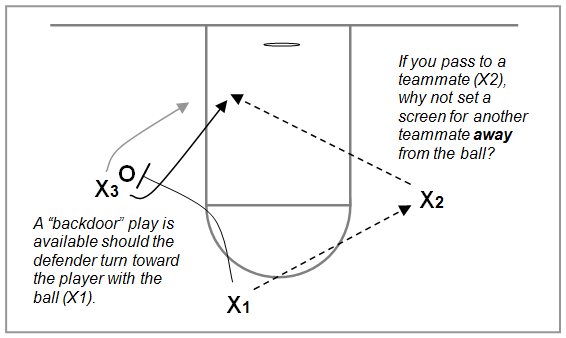 In this instance you are initiating an “off-ball” action that will create a possible scoring opportunity (X3 uses your screen and receives a pass from X2 for a layup). But sometimes another option presents itself in this situation—one that falls into the second category of reacting to an opponent’s mistake. 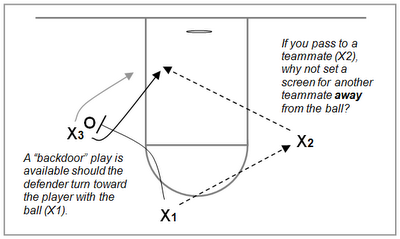 It’s less obvious, but may be more effective in creating a scoring opportunity. Let’s take a look at a couple of other ways in which you can proactively create an off-ball opportunity to gain advantage. Against man-to-man defenses, you can sometimes do so by simply moving to a different spot. This will empty the space you previously occupied and enable a teammate to move into, and take advantage of, the same space. For example, a teammate with the ball can drive into an area you just “cleared out”, one that is closer to the goal and provides a better chance to score. 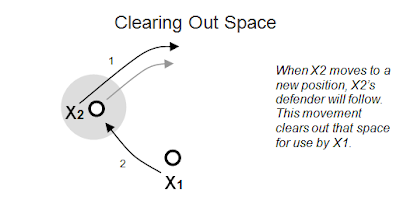 Still another possibility to create advantage in the above situation is for the X2 to take his or her defender away from a spot and then quickly return to it. This is especially effective when an offensive player wants to receive a pass in a specific spot, but is aggressively defended in a way that denies the pass or the desired position. A basketball forward who wants to set up on the “block” near the basket may first need to take his defender away from that spot. 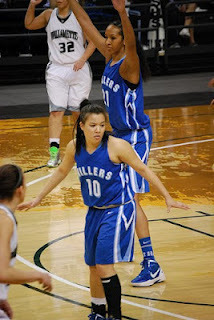 The forward then returns to the block, ideally with the defender trailing behind. Likewise, a guard who wants to receive a pass within his or her shooting range might first need to drive his player toward the basket and then V-cut back to the desired spot on the court. There are many things you can do without having the ball in your hands. To improve your play, try to raise your awareness of the entire “world” around you. Always be aware of the plays you can make away from the ball and try to recognize all aspects of game situations. When you’re on defense, of course, the same principles apply. But in this case, you want to recognize your opponent’s tactics and deny the advantage he or she is seeking away from the ball. But you are absolutely right - beginning coaches tend to just watch and work with the player with the ball. Creating options (and helping kids see themselves into good options) is just good coaching. Thanks Wendy for the "work rate" info. Although the terminology in each sport may be different, there are many parallel concepts. In soccer, where weakside play is more limited by the offsides rule, I would expect players without the ball can still use a "back door" cut to shake their midfield defender to possibly set up up a breakaway or odd-man advantage. Positioning without the ball obviously is crucial at higher levels. Rewarding off-ball play, either by player actions (making the open pass) or through coaching praise is essential during player development. Even at the lower levels of basketball, I'll momentarily stop a scrimmage if the player with the ball misses an open teammate cutting to the hoop. It's important to instill in players the connection between effort and reward.